Apparently a factory-endorsed BMW M2 convertible is not happening. I can’t imagine why, seeing as how the idea of “M-brand performance purity” went up in a cloud of tire smoke from an X6 M. Of course, some tuners agree with me, and now you can take the top off an M2—thanks to a Swiss company called Dähler. Dähler Design & Technik GmbH, based near Bern, sells performance parts for almost every model in BMW’s current catalog. Now they’re just straight-up making their own. 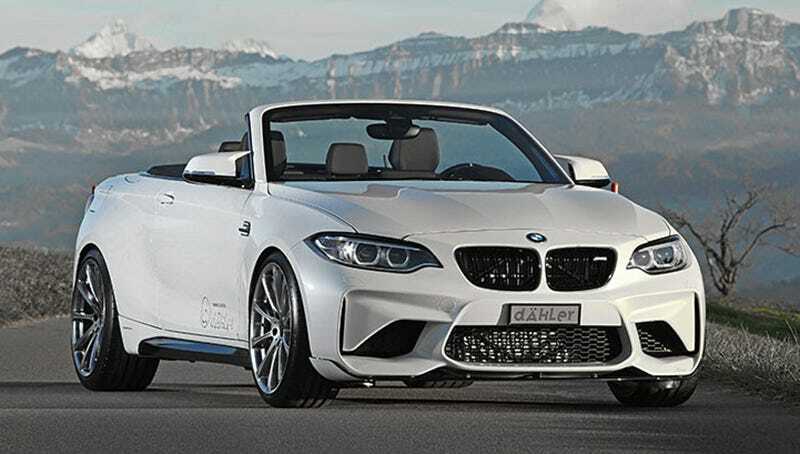 Dähler isn’t ready to put a price tag on this conversion yet, but they did explain in an email that the M2 convertible was based on an F23 M235i convertible, with the M2 body and interior swapped over. The company’s representative Jasmina Schmutz went on to specify that the chassis is reinforced, “remaining components” are all from the M2 and the carbon-ceramic brakes are off the M4. As we guessed, it made more sense to start with a regular 2-Series Convertible and swap M2 parts over, rather than having a saw rip up a perfectly good M car. I dropped the company an email, but most of Dähler’s marketing material is in German so I’m not sure how much detail we’re going to get back. It did release this batch of photos though through a marketing agency and I have to say it looks, well, like an M2 convertible. It’s clean and handsome and predictable. Dähler’s brochure does say that the company will give you the goods to boost an M2's N55 engine to 419 horsepower and 450 lb-ft of torque for about $6,300. Or they’ll cut all the way to an M4 engine swap if you want, but I have a hard time believing the cost (which is undisclosed), labor and warranty nullification on that job would be worth your while. Perhaps if enough people get this company to give their M2s a haircut, BMW will start offering this as a factory option after all. I dig the look, and think pretty much every car is more fun with more wind.